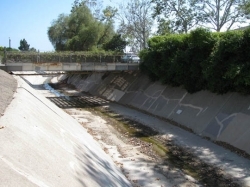 This project will construct capacity improvements to the San Jose Creek Channel that will increase the design storm from a 25 year to a 100 year storm event. The new channel will be 50 feet wide with vertical walls and an articulated concrete revetment bottom. The revetment will include fish passage. The project will require the reconstruction of the entire channel and the replacement of the Hollister Avenue Bridge over San Jose Creek. The bridge project will begin after the channel portion is completed. LEI is providing CPM and NPDES compliance support to the City as a subconsultant to MNS Engineers, Inc.